In our first sneak peek we found out a little about my new serialization that will start in the next season run of BigWorldNetwork: A Prince From Another World. Air Date: August 4th with new episodes every Monday. We also disclosed that it had started as a fan fiction, but has now grown far beyond that. With one more book to follow, A Prince From Another World has become one of my most favorite stories to write. And here is a little glimpse as to why. The two elements that influenced this story the most was one of my favorite TV series, Merlin from BBC, and an old book I read when I was in middle school, Princess Nevermore, written by Dian Curtis Regan. BBC’s adaption of Merlin as a young man grabbed my attention right away, mind you that I haven’t read The Lost Years of Merlin by Thomas A. Barron yet. Colin Morgan, who played Merlin, is a fantastic actor and my type. 🙂 Not to mention his adorable smirk expressions added to the humor this series delivered. The riveting stories each episode consisted of was the very thing that drove me to rekindle my passion for writing. I jumped at the chance to write fan fiction and add my own spin of suspense and conflict to characters that I adored. A Prince From Another World is the second fan fiction I wrote using characters from the series and the first AU. Princess Nevermore helped give me the basis of my story. I wanted to write a contemporary romance story with a mixture of fantasy and suspense. Well, what better way to do that than to introduce a character to a world way different from his own? Though the only similarities this book shares with my story is how a princess, prince in my case, gets transported to another world through a body of water and must find a way back while fighting an attraction to a person from that world. Still, this book provided the first stepping stone to my series. 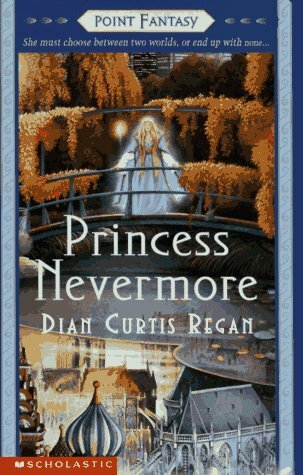 It entertained me for many years growing up and though I never got to read the sequel Princess Nevermore left its mark and I hope to do the same with A Prince From Another World. So there you have it. Every story has some inspiration and influences, these two were mine. What influences your writing?